The ONE AND ONE HALF HOUR Elementary Age Fall Program focuses on the harvest season incorporating Benner’s farm’s rich history. Guides discuss the lives of the seven families who have lived on this property since it’s beginning in 1751, paying special interest to the roles that children played in daily work. We use original tools to demonstrate how wool is turned into yarn, how toys were made from natural materials, pointing out the tasks that typically belonged to the children. We visit the animals and discuss each of their contributions to the farm. Tour the gardens, see composting in action and top off the trip with a tractor led hayride which is a highlight for many children. Fall groups often choose to take pumpkins to fill their homes and classrooms with autumn colors! The ONE HOUR Nursery and Preschool Fall Program is a shortened version of the Elementary program, simplified to better meet the developmental age of young children. We incorporate the themes discussed above relating them to the five senses. We use the noises the animals make, their colors and smells, and even the warmth of an egg in the hen house to gently introduce preschool children to our farm. 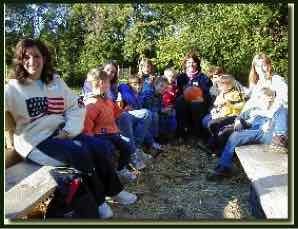 Each tour includes a tractor led hayride and children may choose to take home a pumpkin at the end of the day. Fall Pumpkins are available, ask for prices when you book your trip! Picnic or snacks can be enjoyed on the lawns on a pack in pack out basis. Both spring and fall on a farm are exciting and busy times on the farm. Come join us! The ONE AND ONE HALF HOUR Elementary Age Spring Program celebrates new life and birth on the farm. Children will learn about mammals, hold baby bunnies, see a milking demonstration and be able to bottle feed lambs, goat kids or piglets. They also learn all about farm birds and hold chicks, ducklings, goslings or turkey poults. 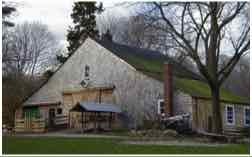 Their tour of the farm will show them many adult animals -some to pet and some to feed, lots of garden vegetables and herbs, strawberry fields, and greenhouse seedlings. Each class will plant some seeds to bring back to the classroom and watch as they grow! 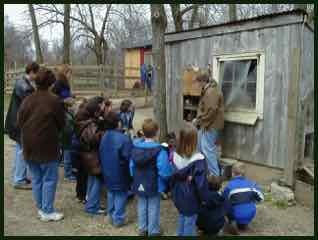 The ONE HOUR Nursery and Preschool Spring Program emphasize using the five senses to experience the farm. Children hold baby animals, feed and touch larger animals, and peek at warm, newly laid eggs. We look for red hens and black lambs and notice lovely farm smells. We listen very carefully to the sounds that animals make (Does a pig really say "Oink?"). We name the farm animals and some of their body parts (What do we call a chicken's mouth?). FERTILE EGGS are available for incubation projects. Call or email for information.